The flower color is red and the flowering period is from about late spring to early summer. Bracts usually remain attractive well after bloom. 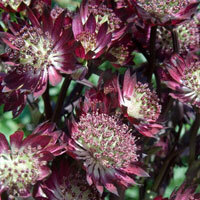 Best grown in organically rich, medium to wet, well-drained soils in part shade. Soils must be kept uniformly moist and not allowed to dry out. Best performance occurs in cool summer climates where night temperatures consistently dip below 20 c degrees. The flowering period is from about Mau to July. It often reblooms in September and October after being cut back. A superb modern variety, producting airy plants topped with beautiful, glossy green and white blooms. 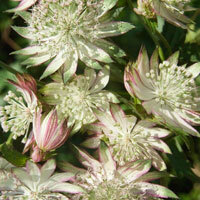 It is one of the best pale varieties, with large flowerheads and more deeply cut foliage. 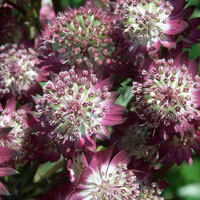 Like all astrantia, it can cope with a range of soils from alkaline to heavy, damp soil in dappled shade. The flower color is red with white centers accented with dark purple stems, floriferous and long-lasting, vigorous grower. 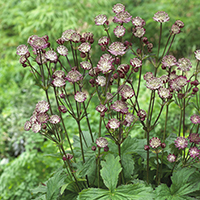 A wonderful woodland plant preferring moist, shady areas rich in organic matter. Excellent for the shady border of for naturalizing along a stream. Gives a good cut flower. Posies of tiny flowers are surrounded by ruff-like bracts, making sprays of intriguing star-like blooms from May to the end of September, sometimes longer. Perfect for injecting colour in an understated manner and these new varieties have been specifically bred to flower longer than the more traditional. Excellent as dried and cut flowers. Perfect for borders and containers. Fully hardy perennial. 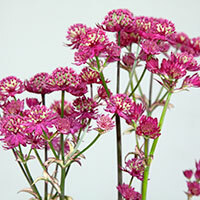 A compact variety with a toch of white and pink in the flowers.Dluster forming perennials with many palm-like leaves. Wiry stems protrude like a canopy of leaves. With round flower head set in a cup of bracts at the top. Excellent cut flower. 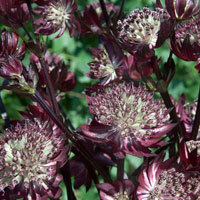 Has spectacular purple red flowers that stand tall above the bright green foliage. They are produced on wiry stems in branched clusters from early through late summer. 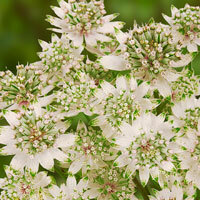 This long flowering perennial is ideal when planted in borders or along streams. It makes an excellent cut flower. 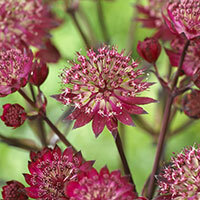 Astrantia thrive in moist, humus-rich or heavy clay soil. 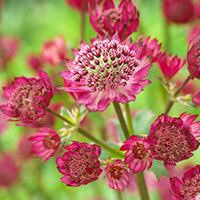 With good soil moisture, Astrantia can be planted in full sun. To stimulate more blooms, remove old flowers.